Every year around mid-April, time by the sun and time by the clock agree. 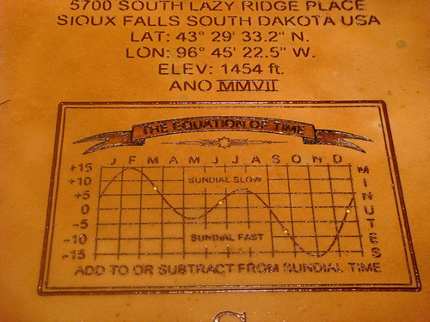 For instance, when the midday sun climbs highest in the sky in mid-April, the sundial reads 12 o’clock noon and your local clock time says 12 o’clock noon. How do I translate Universal Time into my time? For simplicity, let’s refer to places that sit right on the time zone meridian, like Denver or Philadelphia. Midday – noon by the sun – reads 12 o’clock noon standard clock time or 1 p.m. Daylight Saving Time. At present, the length of the day as measured by successive returns of the midday sun is slightly less than 24 hours long. This slight daily discrepancy between the clock and the sun will accumulate until mid-May. In mid-May, midday – noon by the sundial – will come at 11:56 a.m. local clock time or 12:56 p.m. Daylight Saving Time. It’s summer. What’s noon to you? Looking for an astronomical almanac? EarthSky recommends . . . Above photo from Carmichael‘s photostream. Site contents copyright © 2019 Recorder Online	except as noted. All rights reserved. | 88 queries in 2.196 seconds.